Stair Climbs Benefitting Charities are a relatively new phenomenon: “In the past 10 years, tower climbing has really taken off,”. The first well-known climb, New York’s Empire State Building Run-up, was held in 1978. Today there are more than 100 vertical climbs held in North America alone. Many are organized by nonprofits and attract aspiring athletes inspired to rise to the challenge for a good cause. While the vigorous climbs make for amazing bragging rights and will put your glutes to the ultimate test, a reasonably fit person can give one a go. “If you exercise a few days a week and can slowly climb half the number of flights you’d have to master in a race (50 to 60 on average), then you can try a climb,”. If you aren’t quite up to the task this year, make general fitness a goal, then jump into stair-climb training next year. If you’re on the fence as to whether you’re cut out to climb, consider these compelling reason why you should. You’ve Done It For Years Yes, climbing is demanding-but in good way-and you don’t need any special skills or equipment to go the distance. Raising Funds Is Easy The novelty of stair climbs tends to make people more willing to donate. Major race organizers also allow you to create a web page after you register, which makes it easy to solicit donations using e-mail. There’s Breathing Room If you’re put off by the idea of running up a narrow stairwell, know this: Open doors on landings provide ventilation. Also, the starts times of the participants are usually staggered, meaning you won’t climb up an enclosed space with sweaty elbows poking you. “We start climbers 5 to 10 seconds apart for safety. And there’s always the elevator, so if you need to duck out at the nearest landing, you can take the elevator down at any point. 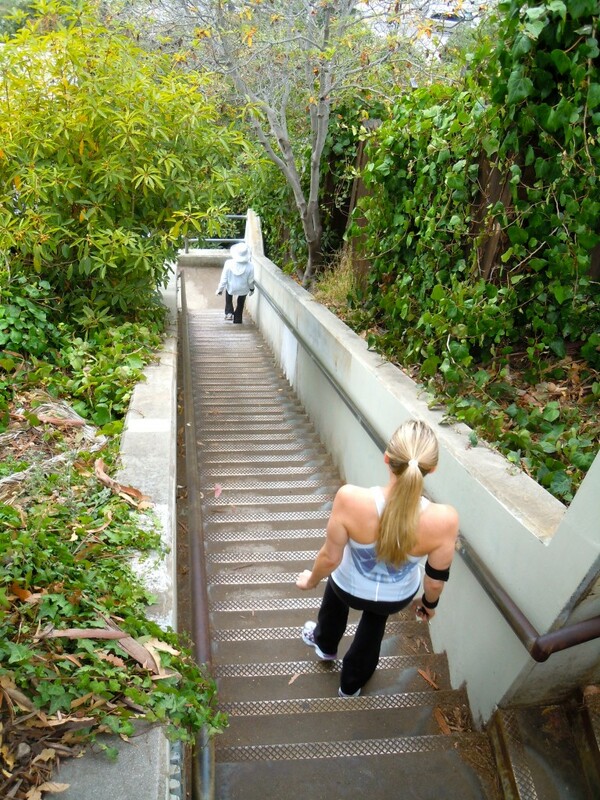 You’ll Burn More Calories Climbing steps require more energy than walking on flat ground. You’ll burn 50 to 100 percent more calories climbing than you would walking. It’s Over Before You Know It the fastest runners made it up 66 flights to the Top of the Rock in New York City in about 8 to 10 minutes. “The average climber takes 20 to 30 minutes. Word to the wise: Pace yourself. And remember there’s nowhere to go but up. If you’re new to climbing, follow these golden rules to get a step ahead. Rule#1 : It’s Ok to hold the railing. Actually it’s preferred. “most racers use the railing to help pull themselves up the stairs. In fact, elite racers use the rail technique to gain speed. Rule#2 : Pass on the left, and step to the right to let others pass you. Rule#3 : Enjoy the view when you reach the top. You’ll want to take it all in (or lie down and then take it all in! ), but don’t forget there are others racers behind you, so have a fellow climber take your picture quickly before moving along! As with any organized event, there’s a protocol for bowing out once it’s underway: If it’s not an emergency, head for the next landing where you can step to the side. If it is an emergency, stay where you are and call for help. 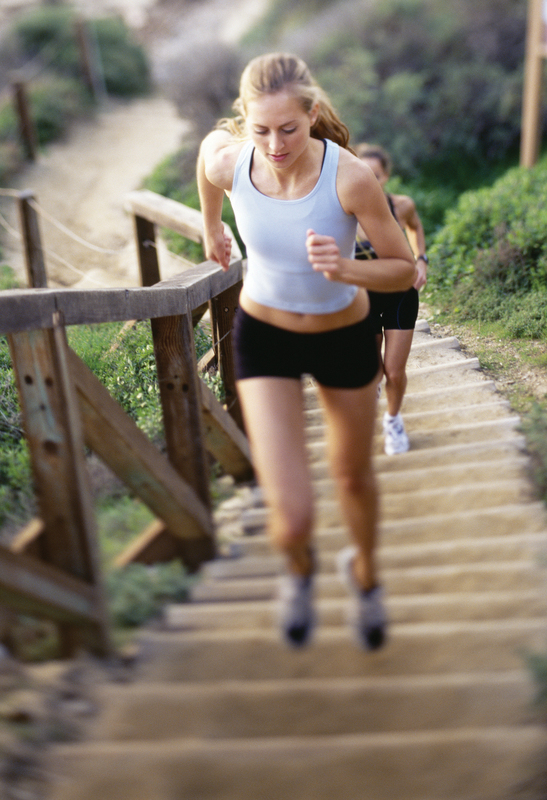 Going down the steps, against the flow of others runners, is unsafe for everyone. If you’re feeling inspired to climb for charity, the four tips below and our eight-week workout schedule will help you achieve stair-racing success. Find A Safe And Secure Stairwell. Make sure the doors don’t lock, or use the stair machine at your gym to practice your climbing techniques. Walk Up Stairs At A Slow-To-Moderate Pace. You should be able to recite the Pledge of Allegiance aloud. Focus on keeping your breathing steady, and take the pace down a notch if you find yourself gasping for breath. On the way down, walk slowly to put less stress on your joints. Also, take few breaks during the descent-or opt for the elevator. On “Strength Days,” Include A Five-Minute Warm-Up, then three sets of 10 for each of the following moves: abdominal crunches, bicep curls with a 5-lb weight and squats with 5-lb dumbbells in each hand. On “Cross Days,” Do Any 30-Minute Workouts you want, such as walking, yoga or swimming. *Rest for three days leading up to the event!